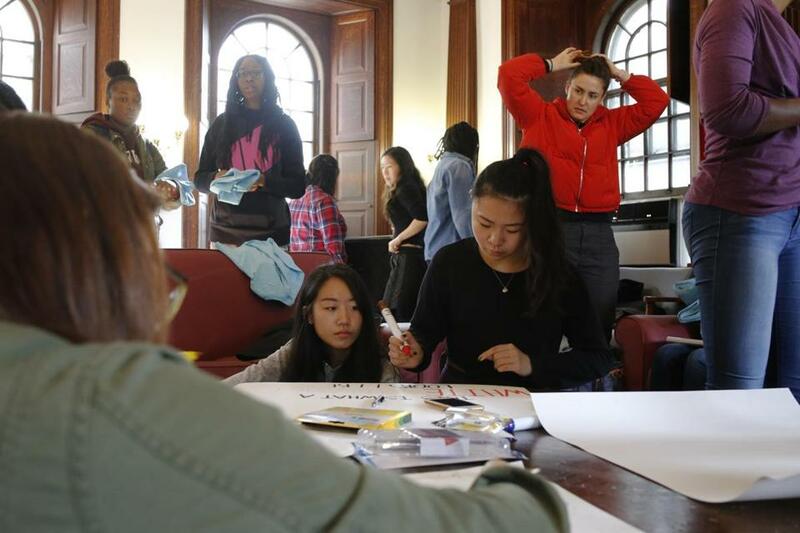 Harvard students gathered in Phillip Brooks House to make signs for a march planned for Sunday in support of affirmative action. As Harvard University prepares to defend its selective, highly secretive admissions process in a Boston courtroom Monday, outside groups are marshaling their forces, with protesters descending on the city, and a rally planned outside the university’s iron gates. The high-stakes case accusing Harvard of discriminating against Asian-American applicants has reopened a sharp national debate over race, equity, and merit. And on campus, it has forced students to confront uneasy and intensely personal questions about racial diversity, privilege, and their place at the Ivy League institution. In animated — sometimes fraught — conversations among friends in dining halls and dorm rooms, in Facebook groups and private texts, in classroom discussions and group gatherings, Harvard’s students are grappling with the issues raised by the lawsuit. Unlike previous affirmative action lawsuits that primarily hinged on if race-conscious admissions practices benefited black and Hispanic students while hurting white students, this case pivots on Asian-American applicants. The lawsuit was filed by Students for Fair Admissions, a group representing Asian-Americans who allege Harvard’s admissions policy discriminates against them. As proof, the organization points to six years of Harvard admissions data that its experts argue indicates Asian-Americans were rated lower on personal qualities, such as courage and kindness, which hurt their chances of gaining admission. The group also alleges Harvard limits the number of Asian-American students it admits every year, a practice called racial-balancing, which is unlawful. Harvard denies any discrimination and insists its admissions practices are legal and ensure that all students learn on a diverse campus and are exposed to different ideas and classmates from various backgrounds. At Harvard, 21 percent of students are Asian, nearly 12 percent are Hispanic, 8 percent are black; the majority of the campus is white. The university is also quick to point out that Students for Fair Admissions is led by Edward Blum. He is a conservative white scholar who unsuccessfully challenged the University of Texas admissions process and led an effort that unraveled parts of the Voting Rights Act. Yet Harvard administrators worry the trial could open up fault lines among students and alumni at the country’s oldest and most prestigious institution of higher education. The trial is likely to raise questions about who is deemed worthy and special enough for one of the few slots at a university heralded for educating future presidents, corporate titans, poets, and prizewinners. 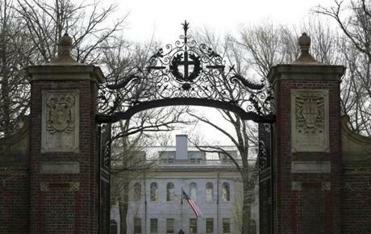 Of some 42,000 applicants, Harvard enrolls just 1,600 or so freshmen every year. Entry itself is a privilege and viewed as a ticket to future success. Some Asian-American students say they already feel conflicted about the lawsuit. They support diversity on campus, but some say the case has reinforced warnings they received from parents and counselors in high school that they had to get far better grades than their peers, jump into leadership roles, and appear less stereotypically Asian in their applications to earn a spot in the most elite colleges. Rainbow Yeung said she worries Asians have been neglected in US history and American media. 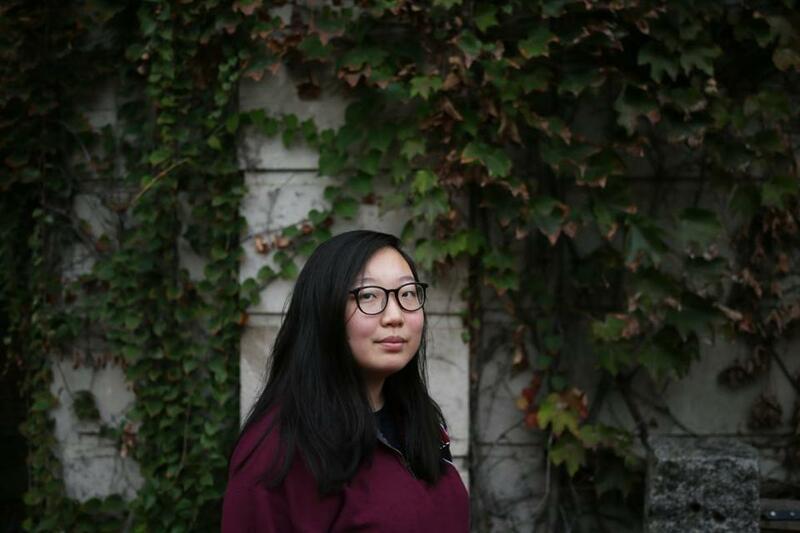 Rainbow Yeung, a senior majoring in molecular and cellular biology at Harvard who rushes between post-graduate job hunting and her leadership responsibilities at her house, said she worries Asians have been neglected in US history and American media. And she doesn’t want their concerns about potential bias in admissions to also be silenced. Ivy Yan, who earned a bachelor’s degree from Harvard in 2015 and is now a graduate student there, has found herself at odds with Harvard administrators. She fought Harvard’s efforts to squash a union for graduate students and as an undergraduate rallied alumni and other student groups after she felt the university’s response to e-mail threats received by many Asian-American female students was inadequate. But now, Yan is helping organize a rally Sunday in favor of affirmative action and is bringing together many of Harvard’s supporters. “I am firmly anti-Blum, but not pro-Harvard,” she said. Still, she understands why many Chinese-Americans, especially those who immigrated more recently, are backing this lawsuit. Even her younger sister questioned the need for affirmative action until recently, Yan said. The case against Harvard’s affirmative action policy is generally seen as a conservative cause and even gained support from the Justice Department under the Trump administration. Yet some conservative students acknowledge that admission to the elite school is based on a complicated formula, with race just one factor among many. Star athletes, children of financial donors, students whose parents attended Harvard, and applicants from under-represented states all get special consideration. Healy said private institutions should be able to dictate their admissions standards. Some students, though, feel Harvard does too little to encourage diversity and that if it loses the case, there will be even fewer black and Hispanic students on campus. As Paola Martinez waited last week for a movie screening at Harvard’s newly renovated Smith Campus Center, where red and orange modern couches are surrounded by ceiling-to-floor glass windows, she scoffed at the implication in the lawsuit that Harvard has too few Asian-American students. Martinez, 37, grew up in the Dominican Republic and takes classes and works at the Harvard Extension School, a program for adult learners. She said black and Latino students and faculty are rarer than white and Asian-Americans. Andrea Loera, 23, a Latina who grew up in Texas and is a graduate student at Havard Law School, said she worries that many on-campus discussions about the lawsuit are being held among students of color, instead of the broader community. A teach-in she attended on a rainy evening last week drew more than 50 Harvard students; most were Asian and other minorities, with just a handful of white students. Loera said she understands that some students of color are concerned about drawing too much attention to themselves, especially around a case that questions whether they belong at Harvard.